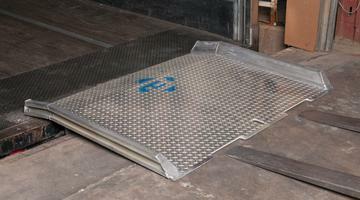 For docks without a forklift the Bluff Aluminum Dock Board is the ideal choice. Built for hand portability, the AC & BC Aluminum Dock Board offers the mobility of a dock plate while providing set capacities you would expect from a steel dock board. 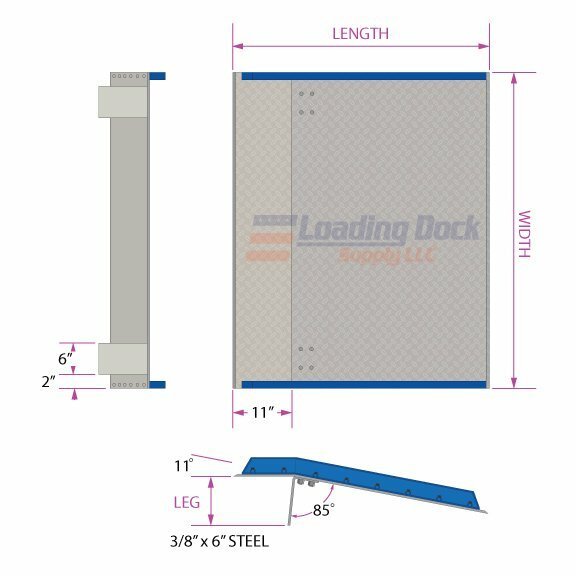 Available in either 3/8" or 1/2" thick aluminum decking, the aluminum dock board offers the capacity of steel dock board at a fraction of the weight. Ideal for loading applications without forklifts or when the environment is corrosive. AC Model Capacity: 10,000 lbs. BC Model Capacity: 15,000 lbs. Eliminate the need to climb up and down from the forklift when placing and removing the Aluminum Dock Board with Speedy Board Cutouts. Simple in design and function, the cutouts are notches taken from the lip of the board to allow the forklift tongs entry to the underside, eliminating the need for cumbersome lifting chains. Worried about moving the Dock board? We have you covered with the optional easy roll attachment; you'll never have to lift and position the Dock Board by hand again! Designed for loading docks without forklifts or where staff are often required to position boards by hand, the EZ-Roll Handle system eliminates the risk of injury presented by moving a 100+lbs board. Simply attached to the side with the side rail bolts, the Ez-Roll handle system cantilevers the dock board allowing for personnel to roll up to the loading dock and position the board. When in use and stored the handles collapse and rest at the sides of the ramp. An alternative to the standard aluminum dock ramp, with steel curbs and legs, the Model ADT dock board is constructed entirely out of aluminum utilizing welded aluminum curbs and legs. 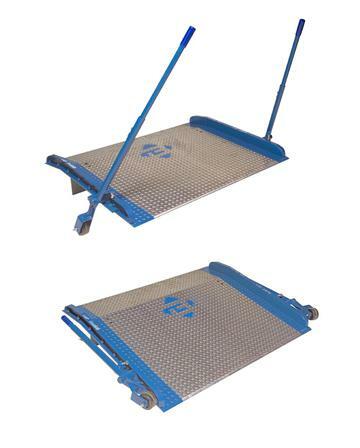 For a more traditional method of picking up and moving the AC and BC model Aluminum Dock Board we offer lifting chains with a heavy duty hook. With access to a centrally located manufacturing facility and 7 quick ship locations, Loading Dock Supply offers offers extremely competitive shipping rates. 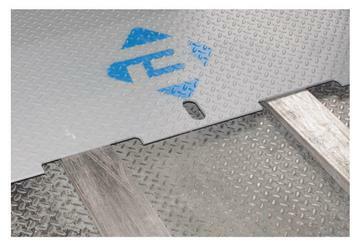 When not available at a quick ship hub all Aluminum Dock Plates ship next day. 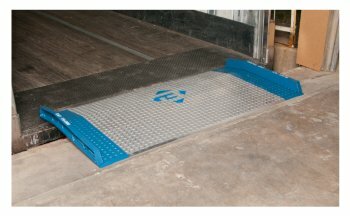 Need Help Selecting A Ramp Model? 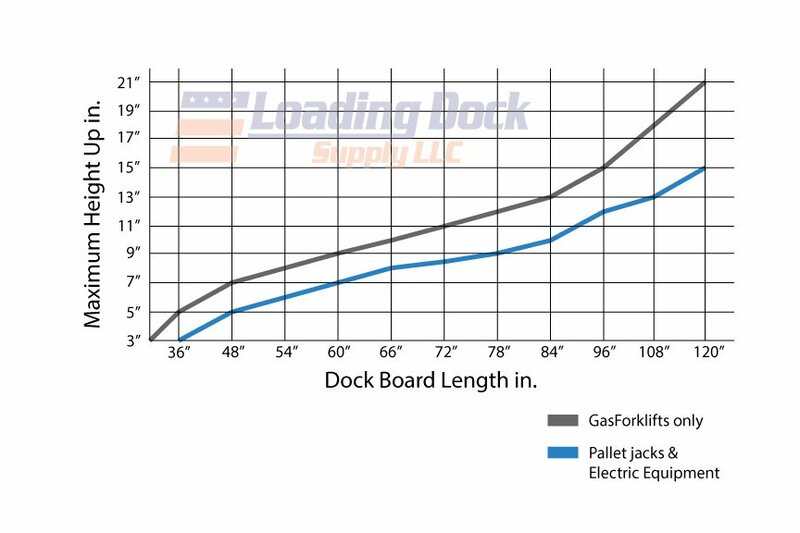 To ensure your dockboard will provide a sufficient grade for your equipment, Measure the greatest difference between dock and truck height to find the differential. 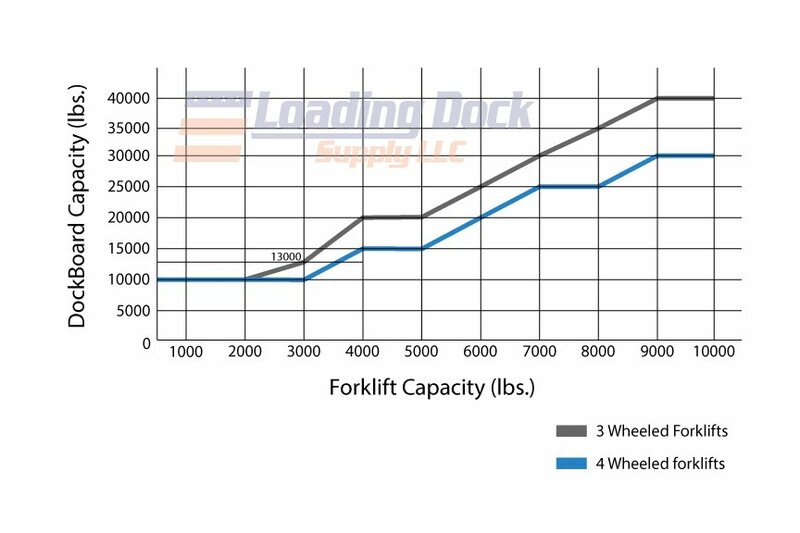 There are two variables considered in the chart (left); Boards for all traffic or just gas forklifts. It is important to know what types of equipment will be used on the board to ensure the length will accommodate a 19% grade for gas forklifts or a 14% grade for everything else. Always be sure to round partial increments up to the next inch. Follow the line across until you intersect with the block corresponding to your equipment type. ​From there follow the line down to the Recommended board length. Insufficient capacity is a serious problem that severely reduces the life of your dock board, putting your equipment and personnel at risk. When determining the capacity you need consider the equipment types used and overall period of daily use. Follow the line up until you intersect with the block corresponding to the equipment type(s). 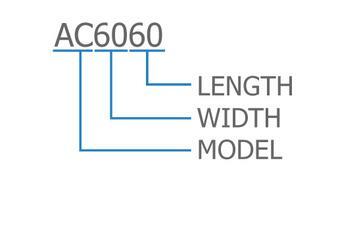 ​Then follow the line to the left (Y-axis) to determine your recommended capacity. Note: operations exceeding 8 hours a day should increase their board capacity to the next level. No account no problem, Loading Dock Supply's experts are ready to provide you with the advice and information you need regardless of whether or not you have an account. For most products, we offer freight rates and lead times over the phone or within minutes via email.